A review of the National Archives of India (राष्ट्रीय अभिलेखागार भारत), New Delhi, India. I spent the early half of 2012 in the National Archives of India, conducting research on late East India Company governance. These archives contain one of the world’s largest collections of South Asian material, covering all of India, and what is now Pakistan, Bangladesh, Myanmar, and elsewhere. Regular series begin in the late 1740s, but random collections date much further back into the early-Mughal and mediaeval periods. Unsurprisingly, the collections are particularly rich in the records of the East India Company, the British Raj, and increasingly, independent India. Holdings also include Persian and Arabic manuscripts, private papers, maps, and microfilms of material deposited elsewhere. An incomplete but still useful list of holdings may be found on the National Archive’s website here. The archives are centrally located at Janpath, New Delhi – 110001, amongst other government and administrative buildings on the corner of Janpath and Dr Rajendra Prasad Marg, and are only two kilometers to the west of India Gate, and two and half kilometers south of Rajiv Chowk (Connaught Place), two major Delhi landmarks. To get to the archives most foreign researchers choose to travel by autorickshaw, an open-sided, cheap, three-wheeled type of taxi. Fares are by meter, or more commonly negotiated with the driver. Most destinations within twenty minutes’ drive are around 60 rupees. Most drivers will not know the location of the archives, so it is better to ask to be taken to the street corner or the neighbouring building complex Shastri Bhawan. The archives are also easily accessible by various modes of public transport. The closest metro station is Central Secretariat (केन्द्रीय सचिवालय) located on the Violet Line; leave the station through ‘exit 2’ and walk straight ahead three minutes to the end of the block to find the archives on your right. Alternatively several buses (505, 522/A/A-1/A-2, 615/A, 970B) serve the ‘National Archives’ stops, right in front of the archive itself. Once you are at the archives, in order to get in you must first step through a curtained doorway into the small security hut and sign in to receive a day pass to the grounds. Showing your pass to the security guards, walk towards the main doors marked ‘Annex’. The main reading room and registration area is to the left of the lobby. Once in the reading room itself, you will need to sign in again on the ledger at the entrance. Bags cannot be taken into the reading room but may be left in the lockers (bring your own lock) or the registrar’s office. In order to register, foreign nationals will need to produce their passports and provide a letter of introduction from their embassy, one from their university, and a photocopy of their passport and Indian visa. 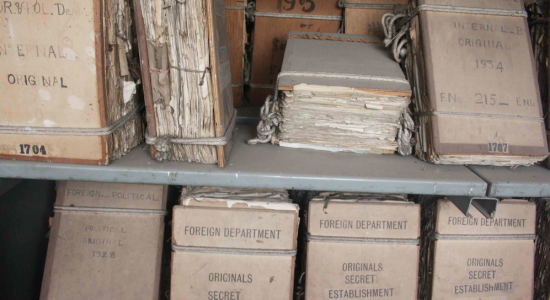 Research visas are not required to visit the National Archives—a tourist visa will suffice. With all these documents in hand, registration takes no more time than filling out a single-sided form and is effective immediately. The archives are open Monday through Saturday from 9:00 to 20:00, including most holidays. However, staff services are limited after 17:00 and during the weekend; researchers are only able to read. Registration and document delivery only takes place during normal business hours. In order to use the archives on holidays and Saturdays researchers must sign up the day or Friday before to be issued with a day pass, the same one you receive every morning from the curtained security hut to gain access to the grounds. Another option for those staying for longer periods is to apply for a special access permit in the reading room. This will allow you to avoid the daily visit to the security hut and advance weekend sign up, and will also let you to use the side entrance to the archive compound, very convenient if commuting by metro. Ask the registrar for the form and provide two standard passport photographs. My colleagues received their passes within one to two weeks, mine however was still ‘in process’ when I left the archives three months later. Most government records are ordered and read in the main reading room where you register. Maps and private papers are located on the third floor. Each has its own reading room, catalogues, and staff, but a permit must be collected from the registrar on the ground floor in order to use these collections. The main reading room has undergone extensive renovations in the past year, and is now outfitted with air conditioning, comfortable tables and chairs, each with their own power outlets, however wifi is not available unless you have your own private internet connection. Searching for material is done in one of two ways. The archive staff is very proud of their online search system, accessible in the reading room on two computers. While this is a useful starting place for finding where some of your material may be located in what record series, the overabundance of typos in the system makes searching by keywords difficult and somewhat truncated. Alternatively, indices of the major departments (Home, Political, and Foreign) from 1860 onwards are located on the shelves of the reading room and multiple volumes of guides to the archive’s various holdings are also available. Researchers looking for items prior to 1860 will have to request the relevant departmental indices for whatever year they are searching from the stacks. Document request slips need to be collected from the staff at the far end of the reading room and one document is requested on each slip, no matter if they are part of a continuous series. Getting the right wording on your request slip is important, but can be tricky. Trial and error, asking the staff and colleagues in the reading room is the best way to get used to the system, as there are no hard and fast rules and formats change depending on the record series. Collection times are 10:00, 13:00 and 16:00. Up to ten documents may be ordered each collection. Documents are usually delivered within two to four hours and are left on the shelves behind the desks of the fetching staff and it is up to you to check and collect your documents. The morning collection was usually delivered by lunchtime, the afternoon collection normally by the end of the working day, and the evening collection, sometimes by the next morning. Most researchers were getting around slow delivery times by stockpiling material. To reserve your documents for use another day, you must place your items on the shelves along the back of the reading room with a note, stating your name and the date until which you would like your items to be held. The archives has a strict policy of not allowing researchers to recall items they have viewed in the last three months, so make sure you are completely finished with your items before returning them; reserved item limitations are not enforced. I was fortunate in that most of the documents I requested, all from the early nineteenth century, were delivered successfully. Colleagues working on the Raj, or independent India were not so fortunate. The archives are infamous for the dreaded ‘NT’, meaning ‘Not Transferred’, which will end up on your request slip if the document could not be located, or in fact was not transferred from wherever it originated. Some colleagues I was working with were getting as many as 80 per cent ‘NT’s each day. Other colleagues received delivery denials due to ‘not enough space to open bundle’. Patience and resubmission is your only method of combat, and sometimes elicit results in your favour. Photography is prohibited in the main and private papers reading room, however maps may be photographed with the expressed permission from that room’s senior staff member. There are photocopying services on site at the cost of six rupees per page for foreign researchers, three rupees for Indian nationals, and there is no limit to the amount you may have copied. Processing times vary, depending on how busy they are and how many documents you need, though two to three weeks is standard. Archive staff claim it is possible to have the copies shipped to you in your home country, but I have not met anyone who has tried this. In general, it is probably best to make friends with other researchers and have them ship you items if you have to leave India before your copies are processed. Larger bound documents may also be reproduced by scanning and put on a CD, costs vary depending on the size of the document, and processing times are similar to photocopying. Options for lunch are limited. In the archive compound itself there is a small canteen, where rather bland dhaal and rice dishes cost 20-40 rupees. Next to the archive’s side gate there is a small dhaba, or roadside lunch stall, that is popular with both foreign and Indian researchers. Filling lunches of local fare can be had for between 10 and 30 rupees. Another popular option is a ten-minute walk away at the canteen in Andhra Pradesh Bhavan [website here]. All you can eat thalis and other South Indian options are available here for around 50 rupees. In the archives, snacks such as puff pastries, sweet biscuits, cookies, tea and coffee are available from 9:30 to 17:00 Monday through Friday downstairs, below the main reading room. The general atmosphere at the National Archives is more-or-less friendly, and most staff are usually willing to assist researchers, as long as patience and smiles are in sufficient quantities. Any questions, problems or complaints can be taken to the head archivist, Mrs. Jaya Ravindran, who is extremely helpful and always has time to meet with researchers. Furthermore the new director of the archives, Professor Mushirul Hasan also maintains an open door policy with researchers and may be approached with any questions or concerns. In all the National Archives of India is one of the most comfortable research locations in India. (1) Regarding the photocopying services, in fact I am an example of an international researcher who actually did receive his photocopies by mail, though it wasn’t an easy process. Ordering the photocopies is in itself a long process for which I had to devote several hours. Part of the process is paying in advance for the photocopies and shipping. A few months after I left India I received a letter from the archives saying that after re-calculating the cost of my order it turned out that I must add to the sum I already paid a few hundred Rupees. The suggestions made for the payment method in the letter were completely irrelevant for me and in the end I managed to contact a friend in Delhi who went there and paid in cash on my behalf. I then received the package with all my photocopies a few weeks after the payment, neatly packed in a hand-sewn cloth package. I heard similar stories from other researchers, so it is a real possibility and an excellent service, not to mention inexpensive. Of course, one must be patient and account for a long period of wait, just like many other things in India. (2) Researchers who are unfamiliar with India may be surprised to find a large family of monkeys who adopted the NAI grounds as their home. They usually ignore their fellow humans, but if you leave the archives after 7pm, for the love of god, do not walk out of the building eating a banana. Trust me on that one. Thank you Ram for sharing your experience of receiving photocopies whilst abroad. I am glad that it was possible for you and will surely be of help for other researchers. And yes, the monkeys are a great sight, and I second your caution. A colleague and I were run down by an angry mother after accidentally getting between her and her baby! Fortunately the archives are now employing a langur (another type of monkey) that keeps the other macaques at bay during the day. A couple of quick updates and comments. 1) If you’re researching post-47, you’ll have to review the Transfer Lists that only staff can retrieve from a locked cabinet. Ask to see the Transfer List guide and submit a request for your volume. They will pull several at a time on one requisition slip. 2) Note down the list, page, and serial number for your document on the side of the slip along with the other required information when you submit the request. An incomplete form will not be filed. 3) The Andhra Pradesh Bhavan raised their prices to 110 rupees for the unlimited thali. It’s worth every rupee. 4) The monkeys are still hanging around, per the guards.